Santec offers hydraulic cylinders in different bore sizes and pressure range, ranging from 25 to 1100 mm and 10 to 700 Bar respectively. Hydraulic cylinders are offered in both welded & tie rod constructions. Special cylinders using one piece barrel are also produced on request. The working pressure is 150 PSI. Cushioning is also provided on request. Sealing arrangement at gland is also available for hydraulic cylinder. Cylinders are manufactured under strict supervision by our quality assurance departments. All cylinders employ international quality seals that are self-adjusting for long trouble free life. Presently, the seals are procured from Hallite, Parker, Nok, SJ (Korea) or equivalent make. Seamless honed barrels of ST-52 grade to a micro-finish provide long piston seal life and prevent failure of the cylinder. 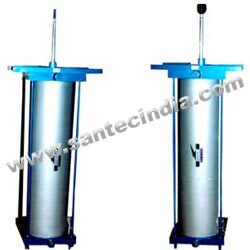 The barrel material is selected on the basis of application & working pressure. High strength steel piston rod is precision ground and hard chrome plated and regrinded to ensure anti-corrosion and maximum seal life. The rod material is EN-9, CK-45 grade. One end of the cylinder is precision bolted in case of low pressure cylinders, but in case of high pressure cylinders the base is threaded & then welding is done with utmost accuracy & precision. All mounts are of steel.